iron stef: The Bobs are Winners! For our office post holiday party (the actual holidays are always too busy to plan a party), we had a dip contest. I loved this idea, but I have made very few dips. I didn't know where to start. Googling "dips" led to numerous results, but most were your usual artichoke, taco, nacho and such dips. Which are all good. But this was a contest! I needed something that stood out...something different, but still crowd-pleasing. I put a plea out to all my non-work friends for any ideas they had. I got some good ideas that I will probably try in the future. But there was one that stood out. It was a suggestion from a friend in Denver, who had had this dip at a restaurant there called the Irish Snug. 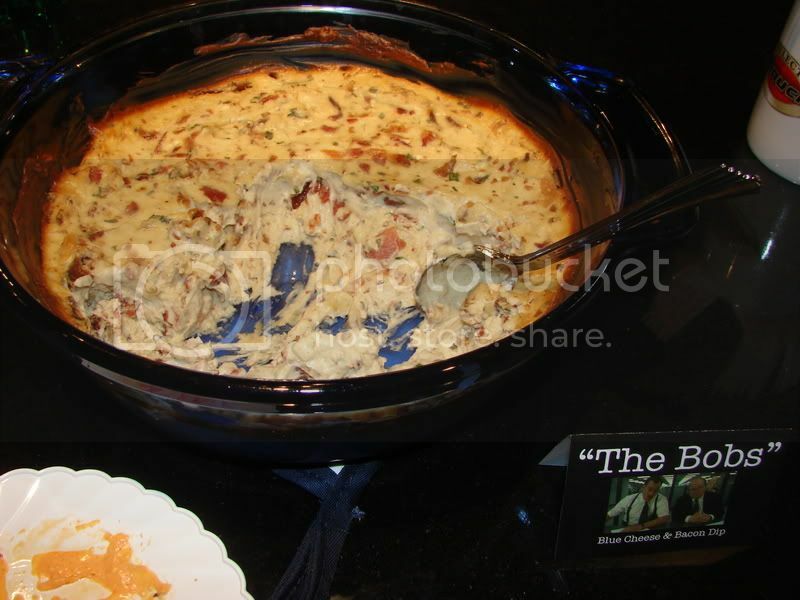 It's a warm blue cheese dip with garlic and bacon. To me, that sounded like a sure winner. Dip contest entrants were encouraged to give their dip a fun name. I went with "The Bobs," a reference to Office Space. There were 6 other dips, and it was a fun contest. 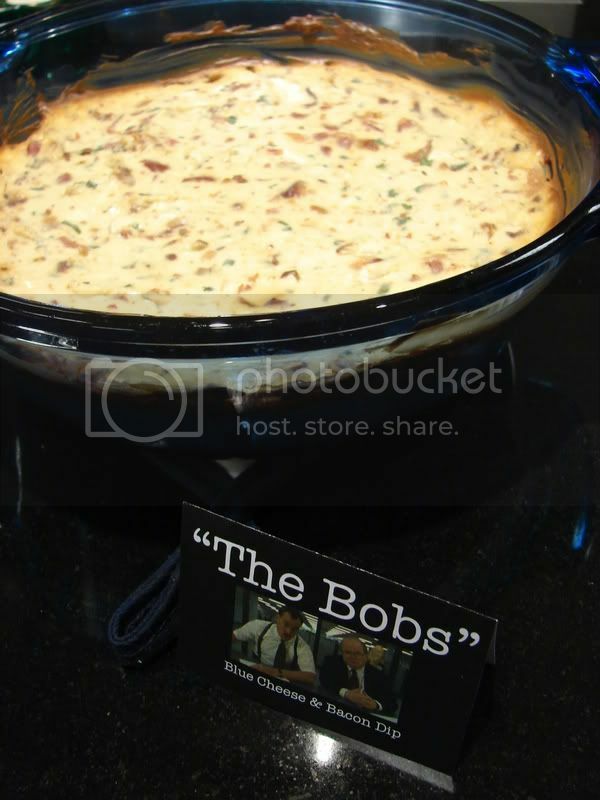 In the end, it came to a tie between "The Bobs" and "Harry Cheese", which was cream cheese mixed with Harry & David's Pepper & Onion Relish, which, despite the over-easy nature of it, is a really yummy dip. But the tie breaking vote went to the Bobs! Yay!! 1. Place bacon in a large, deep skillet. Cook over medium high heat until evenly brown. Remove bacon from skillet, drain on paper towels and crumble. 2. Place garlic in hot bacon grease. Cook and stir until soft, about 1 minute. Remove from heat. 3. Preheat oven to 350 degrees F (175 degrees C). Place cream cheese and half-and-half in a medium bowl. Beat with an electric mixer until blended. Stir in bacon, garlic, blue cheese and chives. Transfer mixture to a medium baking dish. 4. Bake covered in the preheated oven 30 minutes, or until lightly browned.